A few weeks ago I got to participate in the Irish Pub Philadelphia's 25th Annual, Tour De Shore Ride. It's a bicycle charity ride that raises money for children's charities in the Greater Philadelphia Region. Specifically, it raises a lot of money for PAL, The Police Survivors Fund and the Daniel Faulkner Scholarship Fund. I've known about this ride for a few years and always thought it would be a lot of fun to do. The entry fee isn't too high, the minimum amount to raise is less than $200 and it's under 65 miles from the Irish Pub at 20th and Walnut Streets to the Irish Pub in Atlantic City, New Jersey. Add in a bunch of fun loving police and other non-serious cyclists and you have a fun group ride. This year's ride raised over $518,000. Yep, he rode most of the trip bare chested. I signed up thinking I'd maybe find one of my cycling friends but knowing full well that I'd be riding solo and meet people along the way. I prefer to do these larger group rides alone, there are a lot of people you can meet and chat with along the way, so I never feel alone or lacking in company. Plus I don't have to worry about keeping any of my faster cycling friends held back, or annoy anyone I'm with because I want to talk and take a lot of photos. I like the chance encounters, the fast friendships you make because you are doing a sport that you both love. There's also something about the psychology of biking and using both your right and left brain. I find that I can bond very quickly with strangers while we are engaged in our sport and talk at the same time. It's the spirit of adventure. This ride did not disappoint! I met lots of people and talked with cyclists all throughout the day. I never worried that I'd be doing this ride alone, how could I be alone with over 1,500 riders? I may have pedaled off as a solo rider but within 15 minutes I talked to over a dozen people. After 20 miles, I met a woman named Carol Jackson, who came in from Ohio to do the ride! I noticed her very cool bicycle, a highly unusual triathlon bike with no down tube for the seat post to the bicycle frame. I took a few photos of her and the bike even before we spoke. As I passed by her I started to talk to her about her bike, asking her what kind of bike it was, how old it is, and other bicycle related questions. 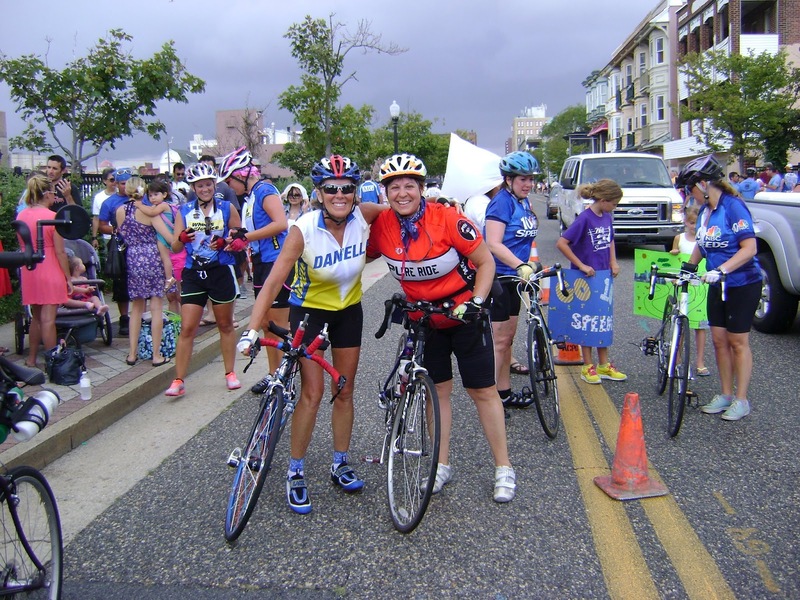 Carol was an easy going cyclist and talking with her felt natural and familiar. She told me that she was with a group of riders who were much faster than her. One of two of the riders in her crew had gotten flat tires at the start of the ride and were eager to make up time, leaving her to ride alone. Since I didn't have a partner or crew, I said she was welcome to ride along with me, unless I kept her back! She thought I was a faster rider and I was thinking that she was the more fit/fast rider! We were a good matched pair. We pedaled together for 2/3rds of the trip, sharing water, Advil, snacks and lots of stories. We had a comfortable and easy pace, cycling and talking. During the ride and especially after, I knew that the this was how the day was meant to play out for me. I'm not sure which one of us enjoyed the company more, I think it was mutual. I loved the casual camaraderie and the way we could just share stories. In someways I think it was an adventure and a mitzvah for the both of us. I met other riders along the way too, exchange a few moments pleasantries about the scenery, our bikes, jerseys and other cycling topics. One guy along the ride kept riding past me and making small, cheeky conversation, such as, he likes rides like this because he can meet cute girls. My response was, "I'm sure you can!" Little did I realize that he was one of my "Morning Biking Regulars" that I see when I do my morning loops around the Schuylkill River. I was wearing a very recognizable and unique bike jersey, that has on the back of it, "Petroleum is Satan's Energy Drink" It's not a sentiment that I'd necessarily seek to emblazon across my back, I like the jersey because it was inexpensive, fits well, and feels comfortable. So, I was recognizable to George, who we call Guy Smiley. I didn't recognize him until the third rest stop when he stopped me, shook my and asked me to tell him my name again. 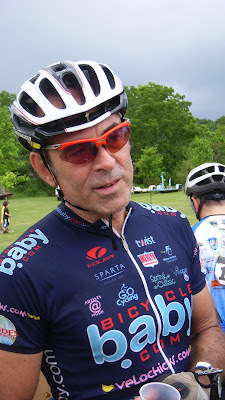 Every time I see George, he's wearing a different kit (shirt/helmet) and glasses and he rides a lot of different bikes. He's not as recognizable in his different garb each morning; he sure wasn't someone I'd expected to see on this charity ride but I sure am glad he recognized me and made the point to talk to me several times until I responded to him! This was the best group and the best charity organized ride I've done. I'm looking forward to doing it again next year and I hope that I can raise more than the $300 my generous friends and family contributed to making this event happen for me. More than the fun, I genuinely believe in the charities that the money supports. I'm always a bit hesitant to ask people to give to these sorts of events, having heard once you are asking your friends to help pay for your hobby. Yes, that may be true to some degree, but if the charity event is near and dear to your heart, then the money is being well spent for a worthwhile cause.